One of the great singer-songwriter albums of all time is back on vinyl. Essential? You bet! "There's an old quote of St. Theresa's that goes something like, 'More tears are shed over answered prayers than those that remain unanswered.' In other words, be careful what you wish for — you just might get it. 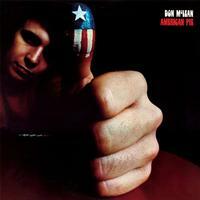 Don McLean, like any other singer-songwriter, no doubt wanted a hit, or some degree of success. 'American Pie' gave him that and more. "McLean's ode to Buddy Holly began with a folky intro that sounded like a protest song. Almost nine minutes later the song finally ends. Sure the song's poetic, sure it's a touching tribute, and sure, it's undeniably a classic. But it also became the bane of McLean's existence for many years as it was the only one of his songs that people wanted to hear. American Pie the album sold well on the strength of the title track, and even propelled the comparatively weak 'Vincent' into the Top 20.